Campeggio de la Vallée si trova a Sant Joan de Pladecorts, Pirenei Orientali, è situato fiume/torrente. Questo campeggio dispone di piazzole delimitate e sia ombreggiate che. Camping de la Vallée si trova nei pressi di una spiaggia di sabbia. È possibile affittare casemobili. Il campeggio dispone di un parco giochi e di un campo sportivo. Il campeggio dispone di una piscina scoperta e una vasca per i più piccoli. Al campeggio Camping de la Vallée è possibile praticare windsurf, canyoning/canoa/rafting e sci d'acqua. Ogni anno un ispettore visita il Campeggio de la Vallée, controllando oltre 200 tra attrezzature e altri punti di interesse del campeggio. L'ispettore è un dipendente ACSI e non lavora per il campeggio. A very nice site with very helpful owners - but not a lot of English spoken. The ground is generally level and pitches are large, but there can be uneven spots within the pitch. Depending which one you choose, you may need an extension cable for the electrics as our 25m one only just reached. There is a choice of 6 or 10amps, again dependant on pitch choice. Facilities are spotless & well lit, with lots of washing-up sinks on the outside. The swimming pool is lovely, heated and with plenty of room to swim. Wifi is very fast, even on the pitch - just say how many devices you want to connect and a code is given for each one. The site is accessed through the village of St Jean Pla de Corts which is a little narrow in places for large outfits but ok. Try to cross the bridge with nothing coming the other way as it really isn't wide enough! This is a lovely site with nice staff and scrupulously clean sanitary facilities. Lovely swimming pool, large pitch, free wifi. Bus service from the village to Perpignan for €1! Really enjoyed the cycle path to Ceret and Amelie les Bains through the cherry orchards. Came for one night and left five nights later. Really good centre for the area. Cycle track all the way to the coast (about a 50k round trip). Only annoying feature was a barking dog at night. The staff sympathised but said that the owner of the dog was uncooperative. Notwithstanding the dog, an excellent site to which we would return if in the area. Volete prenotare il Campeggio de la Vallée o oppure saperne di più? Potete farlo usando i seguenti dati. Le Boulou direz. Céret D115. Alla rotatoria di St. Jean-Pla-du-Corts andare verso il centro paese, a sinistra sul ponte. Segnalato. 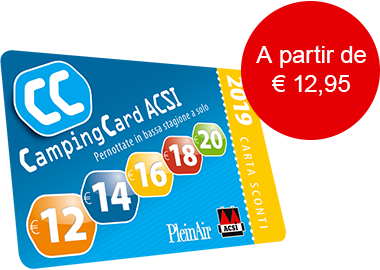 ACSI Eurocampings invia la tua richiesta di informazioni al "Campeggio de la Vallée".